Traveling is probably the most important and enjoyable activity in a person’s life, but we all know that, contrary to the initial expectations, it isn’t all about relaxation. Traveling implies long flights, long car or bus rides, walking and sometimes guiding people around. All of these things can be tiring and require you to rest properly so that you can enjoy your journeys. Sometimes during your travels, you might feel that there is way too little time and so many things to do and see, so you prefer to sleep only a few hours a night. Other times, you might reserve those sleeping hours for the flights or car rides, which is awesome, if you could only rest properly. Having the best travel pillow with you can change everything. The quality of your sleep and the way your body feels changes completely if you manage to have a few hours of good sleep, which is why it is really important to buy the best travel pillow that you can get. There are a lot of factors that can influence the quality of a travel pillow. In this article, we reviewed 5 of the best-selling travel pillows on the market, so that you can choose carefully and make smart investments. Lately, the market offers a variety of options when it comes to travel accessories. 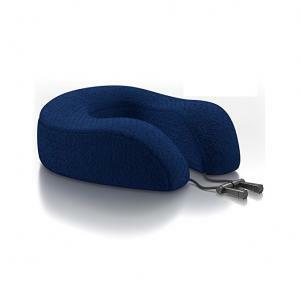 Such a cushion can have a classical shape or a weird shape, but either way, it is surely made with functionality in mind. More than that, some travel pillows even bring technology closer to you, by including related accessories and pockets. Are you searching for the best travel pillow and you have no idea what you should choose? Consider one of the 5 products below, analyze their pros and cons and, in the end, you will possibly be closer to making your decision. This travel pillow that might seem a bit awkward in the beginning is actually one of the most popular products on the market. It is inexpensive and it is designed in such a way that it offers full lateral support, helping you fall asleep in a natural position. Basically, what this cushion does is to encourage natural neck and head alignment and to prevent the head from falling forward while asleep. It has an ergonomic design and it is highly adjustable, which makes it such a good choice. It can be used by holding it as you would hold a messenger bag or tethered. Its 2 x 9 x 3.5 inches size is a bit too large for some people’s tastes, but it is still a practical and functional product. It is covered by a 2-year warranty and an extra cover can be bought separately. What’s to like about the Travelrest - Ultimate Travel Pillow / Neck Pillow? The best thing about this travel pillow is its design. The fact that you can inflate it and use it in no matter what type of vehicle you choose to travel is simply amazing. It is adjustable and lets you sleep without having to worry about awkward reactions when your head falls forward during your sleeping time. More than that, it is easy to carry with you because it deflates easily and can be rolled up. The only thing that could bother you during your sleep is the length of this travel pillow. Except for that, it is simply amazing. 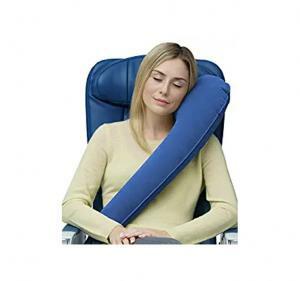 Are you looking for a neck pillow that can also serve your sleeping needs during your travels? The Travelrest could be the travel accessory that solves all your problems. This is considered to be a therapeutic product that also helps you with basic neck and back affections. It comes with a therapeutic design and it is made of thermos memory foam. It provides great neck, shoulder and head support and can help you fall asleep in a minute. This travel memory pillow was originally designed for chronic neck pain, but it eventually started being used by travelers all over the world thanks to its high quality and support. Although it is not inflatable, it compresses and it takes little space in small luggage. The best thing about it is that it comes with a Velcro sack and ear plugs that will help you isolate yourself and get some rest in noisy places. What’s to like about the Travelrest - Ultimate Memory Foam Travel Pillow / Neck Pillow? There are a lot of things that should determine you to buy the Travelrest, as it is one of the best products on the market. It is comfortable, high portable, it offers the support that your head, neck and shoulders need and it is covered with a non-slip material that will keep your head straight while sleeping. This product proves that long travels can still be comfortable. The only thing that raises a question mark regarding this product is the Velcro strap that seems to be ripping apart the nicely designed pillow. Therefore, you must be careful when pulling it away, if you want your pillow to look as good as new for a long time. Another great product that comes at an amazing price is the J-pillow, which has an innovative design and is preferred by some many people thanks to its shape, size and level of comfort that it offers. Basically, it has four sides that can be used while sleeping: a pillow for the side of the head, a pillow for the back of the head, a chin support and a neck support. It comes with a tiny fastener that is ideal for when you want to attach it to your luggage. It is made of soft materials and it can be easily compressed to the size of a tiny cushion. Its 11.8 x 7.9 x 13 inches size makes it easy to carry and very comfortable to use. It is made of polyester fiber that is ultra-hygienic, so you don’t have to worry about the fabric if you have sensitive skin. What’s to like about the J-pillow Travel Pillow - Head, Chin and Neck Support? 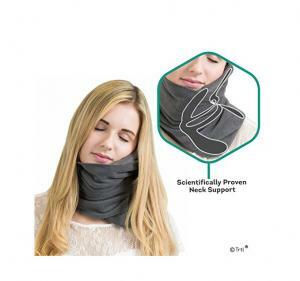 If you are the kind of person that travels a lot and complains about neck or back pain because of a poor posture during sleep, this cushion might solve your issues forever. It provides all the support that you need thanks to its unique shape and it helps you get the sleep that you need, effortless. Although this travel pillow is popular due to its high functionality, some people might find it a bit too bulky, as it does not have a hard cover and it does not compress the way memory foam or deflatable pillows do. If you are used to traditional travel pillows that offer you great support, but nothing more than that, this product will make you rethink the sleeping while traveling concept. This travel pillow that has a U shape is made of natural materials that make it comfortable and suitable for sensitive skin. It is covered in a hypoallergenic, bamboo cover that is removable and washable. This travel pillow promotes good postures and correct spine alignment, by adapting incredibly well to your body’s shape. It comes in navy and it measures 13 x 11.8 x 4.7 inches. Also, it is lightweight and easy to carry with you in your luggage. The best thing about it is its inner filling that contains antibacterial materials, cooling gel that will help you maintain a perfect body temperature while sleeping and consistent memory foam. What’s to like about the CitizenG Bamboo Memory Foam Cooling Gel Travel Pillow? 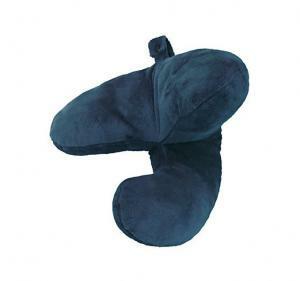 Except for the above advantages that few travel pillows offer, this product includes plenty of accessories that you will need while traveling. When buying it, you also get an eye mask, ear plugs, a comfortable carry bag and a free e-book. Although the design and fabric of this travel pillow are great and reflect high-quality work, it does not offer a proper chin support. If you are a heavier person, chances are that your head will fall forward easily. This is one of the most controversial travel pillows that the market has to offer. When looking at it for the first time, you get the impression that it is a tiny cover, a scarf or some kind of accessory that is too soft to be used as a head support. In reality, it is a long-haul flight pillow that offers amazing neck support and that provides you an ergonomic position while sleeping. It comes in black, light grey, pink and red; it weighs no more than 148 grams and can be stored anywhere in your luggage due to its small size. It measures 7.5 x 7.5 x 3.7 inches and it wraps around your neck just like a scarf. What you have to do before wearing it is to unwrap it and place it on one side of the neck, then wrap it up and take your sleeping position. What’s to like about the Trtl Soft Neck Support Travel Pillow? The best thing about this travel pillow is that it isn’t actually a pillow, but a neck support that you must wrap around. It is made of a soft material, it is comfortable to wear and it will not irritate your skin. You can use it on either side , keep your neck warm and wear large headphones at the same time, which is great. This innovative product solves some of the issues that other travel pillows cause. However, it does not offer the support of a round or U-shaped pillow in the back of your head. At the same time, it isn’t as soft and hard as other, larger pillows. Does a travel pillow really make traveling more comfortable? Traveling occupies a lot of space and time in our modern lives, which is why it is extremely important to make the most of these moments and not simply waste them. As traveling has become a habit in most people’s lives, we found all kinds of methods to relax while flying, commuting by car or by bus. Some people listen to music, podcasts, watch movies or read. Others even meditate during air flights. Having all kinds of smart devices with internet connection even when in the air helps a lot, but there are times when all you want to do is put your whole life on pause and relax. A travel pillow is an accessory that many people disregard. However, we should all own one, as it brings a variety of benefits. Besides making traveling more comfortable, it also has a few health benefits. If you take a close look at the chairs in the airplanes, cars or buses, you might notice that their manufacturers try to give them a shape that is as ergonomic as possible. Even so, due to the fact that we aren’t all the same, they aren’t always as comfortable as we would like them to be. This is where a travel pillow comes in. They help adjust the neck and back alignment, so you will sleep better. Neck, shoulder and back aches will disappear for the same exact reason. Also, the tension in the muscles can be relieved when using a good travel pillow. When should you buy a travel pillow? Most people think that a travel pillow is only practical when flying for at least two hours. The truth is that it can be of great help at all times. Did it ever happen to you to fly for only an hour but have neck pain for the entire day? This means that you were, in fact, affected by poor posture even during this short interval. Therefore, a travel pillow is recommended regardless of the period of time that you spend traveling. However, it isn’t a good idea to use it while driving, as you could relax too much and fall asleep. If you are the lucky passenger in a car that doesn’t have to drive, then you can surely use a travel pillow. U-shaped travel pillows are some of the most frequently encountered models on the market and also, some of the most efficient. Of course, the materials that it is made of matter a lot. What are the best travel pillow materials? Travel pillows, also known as neck pillows are known for their comfortable materials. Some of the most popular models are those made of foam. Besides foam pillows, the market also has to offer beads, down, polyester and wool pillows. Unlike foam or wool, beads can be quite heavy. Polyester pillows don’t offer the best support. Down pillows are lightweight, yet larger than the other types. Their disadvantage is that they can be difficult to clean. Wool pillows are more expensive, but they are extremely soft and maintain their shape for a longer period of time. In the end, foam pillows are the best choice for everyone, but if you have a sensitive neck you should look for the degree of firmness that is suitable for you. Everyone wants to travel and experience some of the best moments in their lives far away from home, which is why most people choose to fly internationally. Although it is a small object that seems insignificant at first, a good travel pillow that fulfills all of your needs can be a real life saver. Imagine having to sleep in your seat without something to support your head, neck and shoulders the whole flight. It can be not only uncomfortable and nerve-wracking, but also unhealthy for your body. It can take days to start feeling better after sleeping uncomfortably for long hours, which is why it is worth your time and money if you can find the best travel pillow for your needs. Depending on what you are looking for in terms of fabric, thickness, shape, size and support, you can go for one of the models that we reviewed above or look for similar ones on the market. Either way, you should finally start feeling comfortable during your flights and car rides.